THANK YOU ALL FOR ATTENDING OUR FISH FRY'S!! Together we raised over $23,000 for the Kids of Sun Prairie in 2019! 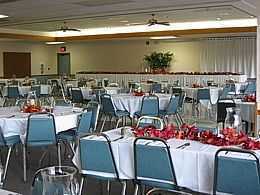 Ideal for wedding receptions, banquets, business meetings, holiday parties and more, The Round Table in Sun Prairie is one of the area's finest and most versatile banquet facilities. Our convenient location in the Sun Prairie Business Park at Highway 151 and Highway N makes The Round Table easily accessible from all directions! We feature a comfortable and modern facility that can accommodate both small and large groups, with seating from 25 to 350 guests and lots of convenient parking. At The Round Table you and your guests will enjoy our large and newly remodeled cocktail bar and lounge that will create the perfect atmosphere for your special occasion. The cocktail bar and lounge may be used in addition to or independently from the rest of the facility. Whether you are hosting a business meeting, banquet or other special event, The Round Table will provide a memorable experience at an affordable price. Our wedding brochure will give you an idea of the types of menus available. Additionally, our staff can design a menu of unlimited variety if you prefer something not found in our package. At The Round Table, we will make sure that your meeting is a success. 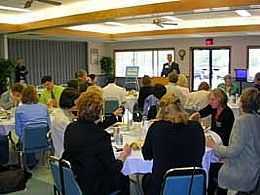 We have specialized in meetings and banquet services since 1993. The Round Table name denotes a tradition of quality service and food presentation. You can choose menu selections from our several catering menus. Whatever you choose, relax and enjoy your day at The Round Table. © 2010 - 2019 The Round Table, All rights reserved. Page Summary: The Round Table Banquet & Meeting Facility offers Madison wedding receptions, Sun Prairie banquet halls, De Forest reception halls as well as Columbus banquets, Waunakee banquet facilities, Cottage Grove meeting rooms, and Stoughton catering services, Marshall meeting facilities, Windsor conference rooms, Middleton bingo in surrounding Dane County Wisconsin communities.